Whenever one returns from a long journey, it is great to return home. Our adventures and “Musical Time Travels” final stop is home to “Colorful Colorado.” The DCB will enthrall you with musical visions from our snowcapped Mountains, and selections such as “Red Rocks Fanfare" by Bogenschutz and “Colorado Blue” by Jared Spears. An additional bonus to the DCB performance is a performance by the DCB winner of our annual young artist competition. Showcasing young talent from Colorado is an exciting way to complete our final formal concert of the year. Please join us for the music of the most beautiful state in the USA and the sounds of the newest generation of musicians! The Denver Concert Band will begin their 57th year of performances in the fall of 2018. A 90 piece adult community band of volunteer musicians; they perform year around in the Denver Metro Area and throughout Colorado. Known for their rich sound and delightful variety of music, there is something for everyone in their performances. In recent years the DCB has collaborated with outstanding soloists and ensembles including the Queen City Jazz Band and the Navy Band Northwest. Their summer pops concert season in 2018 was well received and they enjoyed playing a concert at Denver’s new Levitt Pavilion. 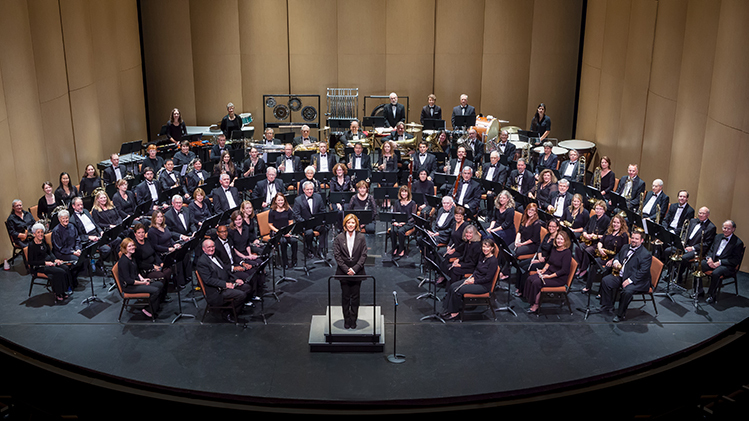 The DCB enjoys presenting performances in the Lone Tree Arts Center and they're proud of their heritage as one of Colorado’s premier community concert bands. Click here to purchase a package of all 4 DCB shows this season.